One of the serendipities of traveling is meeting people on airplanes. I usually have a routine when I get on a flight. Backpack stored above, book, iPad, or computer placed in the seat pocket in front of me, and then I look or wait to see who the Lord puts next to me. Sometimes my neighbor for a few hours dives into a book or listens to something on his or her phone. At other times, he or she immediately engages in conversation. With an hour left in the flight, I grew tired of reading, and the thought came to me to get the airline flight magazine and work the Sudoku puzzles. The idea was a little strange to me because it was not in my routine, and I’m definitely a routined person. However, the impulse was so strong, that I reached for the magazine, found the puzzles, and started solving them. As I wrote numbers in the boxes, I became aware that my seat mate stopped reading her book and was watching me work the puzzle. I paused and acknowledged her with a smile, and then she asked, “Would you explain that game to me?” Of course! This was my opening that I prayed for. I immediately realized God was answering my prayer for help. After explaining the object of Sudoku, I asked her if she lived in San Antonio or if she was going for work or to visit someone. I’ve learned to ask that question because it usually will be countered with a question about why I was traveling, which is exactly what happened. “Were you in Chicago for work?” she asked. When I told her that I was speaking in Chicago and that I was with The Spirit of Elijah Ministries, she asked about the origin of the name and what I spoke about. That’s like throwing a slow pitch right over the strike zone of the plate to an experienced slugger. From that moment on, the conversation moved from my work to the Bible, to how the Bible came to be, to its Author and the men through whom He wrote, to who the prophet Elijah was, to fathers revealing the heart of God to their sons as a shadow of the gospel, to an explanation of what is meant by “gospel”, to the power of love, and finally to an inquiry if she had ever read the Bible. Surprisingly, she told me that she had a Bible on her bookshelf at home, but had never read it. She asked where she might read about the things of which I spoke, and I suggested she read the gospel of John. I gave her my business card, and told her I would be happy to answer any questions she might have as she read. By that time, we had landed and after thanking me for the conversation, we exchanged a friendly good-bye. I haven’t heard from her since that night, but she was in our prayers for the next few days and then periodically as she came to mind. I don’t know what God did in her heart as she listened to the gospel and heard about God’s love and family relationships governed by His love. She obviously wasn’t hostile to what I shared and seemed genuinely interested. However, I do know what God did in my heart. First, God revealed again that He is with me. Second, I was encouraged that God heard my feeble prayer for help to begin a conversation which led to the sharing of the gospel. 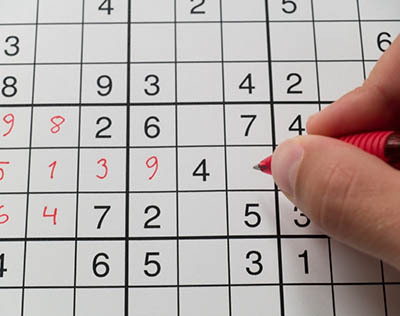 I had no idea how to begin that exchange, but God knew exactly how — the Sudoku puzzle. Third, I experienced the Holy Spirit’s guidance throughout the conversation. It seemed obvious to me that He was putting the right questions in her mind that guided the presentation of the foundations of faith and the gospel. When I was wondering what to share next, her questions guided me. Fourth, God’s love and compassion for her poured through my heart and soul. The awareness that He loved her and expressed His love through me energized me and nourished my soul. Overall, I was amazed (and am still amazed) at Jesus, who lives and moves in and through our lives for His glory. I think this story came to my mind because it serves as a wonderful example of the most powerful words God has ever spoken to mankind, namely, “I will be with you and never leave you.” Those words simply mean that God loves us and is always with us to help us in our time of need. Whether our need is for help to share the gospel, help to know how to pray, a cry for wisdom in decision-making, or a plea for help to believe what God says, God has given us every encouragement to ask and keep on asking Him for help. The Jesus stories I’ve shared with my readers this year all have this encouragement in common. We have Jesus stories in our lives because Jesus is with us. His presence in our lives testifies to His love for us and the riches of His grace which He lavishes upon us (Eph. 1:7). “We are His workmanship,” wrote the Apostle Paul to the Ephesians (Eph. 2:10). Since Jesus is with us and is our High Priest, we may have confidence to draw near to God’s throne of grace to receive mercy and grace to help in time of need (Heb. 4:14-16). All we need to do is draw near and ask for help. God sent His Son, Jesus Christ, so He could be with us. Matthew, Jesus’ disciple and author of the gospel, wrote that all the events surrounding His birth were to fulfill what was foretold by the prophet Isaiah, “Behold, the virgin shall be with child and shall bear a Son, and they shall call His name Immanuel,” which translated means, ‘God with us’” (Matt. 1:23). Are you one of the they referred to in verse 23? Do you recognize that Jesus is God in the flesh with us? He is the Almighty, wonder-working, sin-removing, soul-saving, heart-changing, life-giving, love-producing, hope-instilling, ever-present indwelling Savior. Is there anything in your life that you are trying to do in your own strength? Is there some sin you are trying to overcome? Is there a relationship that seems impossible? Do you struggle believing that God loves you and wants to be with you? If so, please let me encourage you to surrender yourself to the Lord Jesus, humble yourself before Him, seek His face, and ask for help. Without Him, whatever you do isyour story which will pass away and be forgotten, but with His presence and help, whatever you do is His story for His glory and will never pass away. You may listen toThe Father’s Heart Revealed HERE or watch Norm’s message HERE. I hope this Christmas you’ll be tuned in to the songs of Immanuel. Let your heart be amazed that by faith you have become a participant in the Jesus story. For indeed, if you believe in Jesus, God is with the people with whom you live. You are Immanuelto them. Let His light shine!